It's been sometime since I have posted a question, and I am feeling good about having one to ask....meaning it's a legit question (for me) and not a 'I would like to know something just so I can join in on the conversation' question. I believe my battery is needing to be changed out. The bike turns over at the start of the 1st crank and then drops off almost immediately and sounds like a 'dead battery' crank. Any further cranks all sound like a dead battery turn over. With a multimeter on the battery it has 12.30+ resting volts and drops down to 2.3ish when attempting a crank. It returns to 12.20+ volts with only the slight drop noticed. I know this really isn't a 'load test' but is it telling me what I think? I have called around and I can only get a OEM "61 21 1 459 650" battery without ordering/waiting. The parts guy wasn't able to tell me anything about the battery other than, "I have one in stock." I don't know the AmpHr or the CCA. Searching on Google I found a BMW Battery with the same part number and it's listed as 12V 25A 130A, I assume it's the same battery and also that the 130A is the Cold Cranking Amps?? I have also found a battery that appears almost too good to be true. It has a whopping 530 CCA, more than enough to ensure the starter cranks the engine in the cooler mornings. It does warn that, "LiFePo4 Batteries are sensitive to heat. If the battery will be sitting directly on top of the engine and/or surrounded by the oil pan, we do NOT recommend using any Lithium Battery." I don't believe this is a concern on my K100LT. Of course I am certain that there will be a price difference, I didn't ask what the price was for the OEM battery although I am sure it'll be around the $100 - 150 mark. The LiFePo4 will likely be $310 + s/h & duty, so closer to $400 which is a bit more than what I want to spend on a battery. But if it would give me 4 years of excellent cranking than it would be worth it. So, the question. As my bike is getting older everyday, is the high cranking amps good or bad. Are the 130 CCA's of the OEM enough for the bike, does anyone have any experience (good or bad) with LiFePo4 batteries? I know the answer is dependent on lot of variables, how old is the bike (1990 with 154,000+ km), the riding (fair weather), some extra electronics/electrics, bank account balance (heavy bold red font). I am leaning toward the OEM just purely for cost, it's available now without waiting, and there won't be any surprises. But the lower CCA's cause me concern. The battery I use is an AGM (Absorbed Glass Matt) and around 350CCA and 30 AH. There are quite a few brands around but my choice is the Yellow Motobatt. I got 7 years out of the last one. Don't believe that a Genuine BMW battery is any better than any of the major brands because you pay heaps more. The best Batterie for the Ks it's the Kung Long. The Germans use it very often. There is also a 22vol version but the the 18vol is good even for the ABS version. Hey Todd. I have an AGM Motobatt MBTX30U 30Ah battery as well . Its a smidge tall for the battery carrier as noted above but with some minor adjustments it fits ok. Mine actually screws down with the oem battery bolts, but only just.... not ideal. I'll get around to finding some longer bolts sometime. Their 25Ah/300cca battery, which I think is just about on spec for a K100 is a bit too wide for the carrier unfortunately. AGM batteries are very low maintenance. They can sit for a month or more without losing any significant charge. And they should last significantly longer than lead acid. If you shop around. You'll probably find a cheaper brand of sealed battery online. Personally, I wouldn't bother with a litium battery for normal road use. You'll want to avoid cranking your starter on a low battery. That can damage the starter relay. There is a lot of electrical flexibility in the battery requirements for a K100, and the motobatts mentioned above should be fine. The significant issue will be physical fit, as mentioned by several. 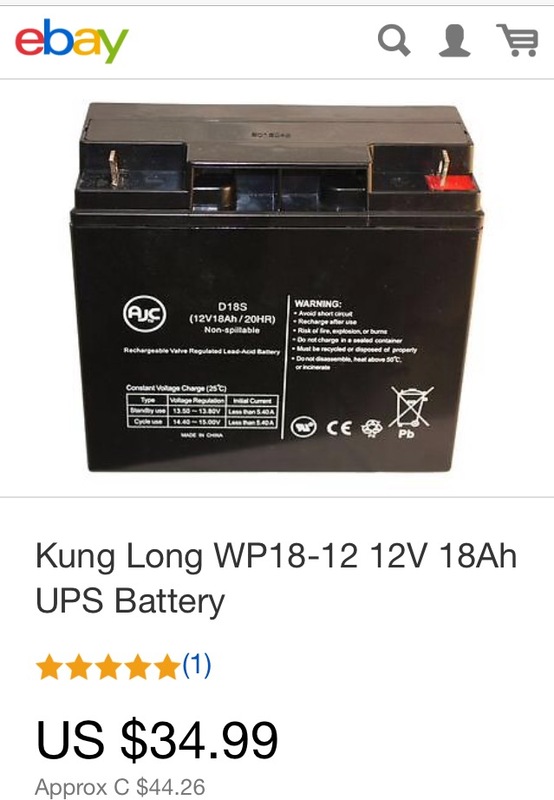 With the Kung Long, it is labelled as a UPS (Uninterruptible Power Supply) battery, so I don't know how it will stand up to the vibration and bumping of a motorcycle application. A UPS is typically located in a stable location in a building. I don't know what the Cold Cranking Amps capability is. If the Germans use it often, I expect it would work OK, but a bike is a bit outside its design purpose. Price is great, though. I really did want the Lithium Iron Battery but I couldn't justify the price. They didn't have any at all anywhere near my location when I checked. Plus I was looking for a really good battery vs. one for cheap. I hope to not have to change the battery for.... ever. Good choice I have seen som very good comments on the Deka batteries. I am sure I could have found one by doing a lot phoning and a bit of driving, but for me there is nothing better than looking and reading online. Every battery I considered I read as many reviews as I could find comparing the pros and cons all the while trying to keep it reasonable..... yup, I over thought it, but hopefully I won't be disappointed with my decision.